New Delhi: Dr Ashok Seth, chairman of Fortis Escorts Heart Institute & Research Centre, New Delhi and Dr Davinder Singh Rana, chairman of Sir Ganga Ram Hospital, New Delhi have been selected for Dr B C Roy National Award 2014-15 for excellence in the field of medicine. The award will be presented by the President of India in July 2017. Chennai: Apollo Hospitals is keen to partner with experts to create a framework for a smart healthcare system, according to Sangita Reddy, joint managing director, Apollo Hospitals Group. Mumbai: Holding that doctors are duty-bound to detect any anomaly in a foetus early on, the state consumer disputes redressal commission recently ordered a nursing clinic in Nashik and a doctor couple attached to it, Dr Pradip Pawar and Dr Suwarna Pawar, to pay Rs 17.5 lakh as damages to a woman who gave birth on March 16, 1999, to a girl child with severe spinal defects leading to paralysis waist down. The mother had approached the commission in 2000 alleging negligence by her doctors in not detecting the defects, despite conducting over half a dozen sonography tests. Bengaluru: Karnataka Consumer Disputes Redressal Commission has directed Fortis Hospital to pay Rs 23.54 lakh as compensation to an advocate whose wife died in the operation theatre of the hospital on February 11, 2010. Advocate H N M Prasad had filed a complaint alleging that the hospital was not well-equipped to conduct the operation and neither the victim nor her attendants were forewarned about the risks involved. New Delhi: The Supreme Court has upheld the stand of the union government for penalising the generic drug-maker Cipla for alleged ‘over pricing’ under the Drug (Price Control), Order 1995. The government had asked the firm to pay around Rs 1,768.51 crore for alleged over pricing. The argument of Cipla and other pharmaceutical companies facing similar charges is that seven bulk drugs are wrongly included in the Drug Price Control Order (DPCO). 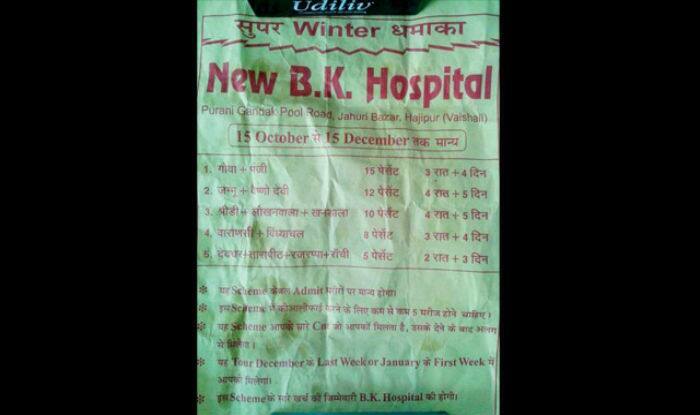 Patna: A pamphlet, purportedly issued by New B K Hospital in Hajipur offering attractive tour packages to those admitting patients to the hospital, has gone viral on social media. Under the “offer”, valid from October 15 to December 15, a person will require to admit at least five patients to the hospital to avail the “scheme”. The pamphlet also says that the scheme is in addition to the “cuts” the agents regularly get from the hospital. The hospital, however, has denied having issued any such pamphlet. New Delhi: The union health ministry has come up with draft medical devices rules proposing stricter regulatory norms for companies selling medical devices such as stents and orthopaedic implants to ensure quality. The draft proposes to make it mandatory for all medical devices to carry manufacturing and expiry dates. It also suggests that companies must seek approval for their products from the regulator before launching them in the market. Chandigarh: A team of researchers at the Indian Institute of Technology, Ropar (IIT-R), in Punjab, are trying to use radio waves to treat breast cancer, the most common cause of cancer deaths among women in India. Were such therapies to be successful, they could emerge as a competitor to conventional radiation and chemotherapy to treat cancer. Because they employ low-frequency waves, RF treatment would be far less likely to damage healthy tissue and also avoid the unpleasant side effects of such therapy. Eluru (Andhra Pradesh): A house surgeon at ASRAM Medical College in Eluru committed suicide by jumping from a three-storey hostel building late on Wednesday night. The deceased, identified as Dr Balabadhra Ritesh (24), had completed his MBBS last year and was reportedly suffering from depression. New Delhi: An estimated 14 per cent (15 crore) of Indian adults are suffering from a diagnosable mental illness and 1 per cent of the population is vulnerable to “suicidal risk”, according to the findings of the first ever National Mental Health Survey (NMHS). Around 10 per cent of the population suffers from common mental illnesses, including depression, anxiety and obsessive compulsive disorder (OCD). The survey further revealed that out of 100 Indians suffering from mental illness, nearly 83 have not been treated. Rajamahendravaram (Andhra Pradesh): Dr Karri Rama Reddy, a psychiatrist, has been selected for Dr B C Roy Award for 2014 for his “outstanding service in the field of socio medical relief”. Dr Reddy passed MBBS from Andhra University and obtained MD degree in psychological medicine from NIMHANS, Bengaluru, in 1980. The award will be presented by the President of India in July 2017. New Delhi: The AIIMS governing body attended by Health Minister J P Nadda on Friday approved that all faculty could work till the age of 67. However, this won’t apply to Director, which is an administrative post. The governing body’s decision has to be approved by the union government before it gets implemented. The move has miffed young doctors, who feel it will hamper their growth prospects. “There is going to be stagnation at the top, and in effect, it will affect the recruitment of new professors,” said an assistant professor at AIIMS. New Delhi: Union Health Minister J P Nadda on Friday directed the AIIMS administration to take all necessary steps to operationalise the upcoming National Cancer Institute (NCI) at Jhajjar in Haryana by April 2018. Thiruvananthapuram: The government medical college, Thiruvananthapuram has banned wearing jeans, t-shirt and leggings by the MBBS students. The wearing of flashy ornaments by girl students also has been banned. The new dress code has been issued through a circular by vice principal of the medical college after a meeting with heads of departments of the college and hospital. Bhubaneswar: Odisha health and family welfare minister Atanu Sabyasachi Nayak resigned on moral ground on Friday amid mounting opposition pressure over the SUM Hospital fire on Monday that killed 25 people. Chief Minister Naveen Patnaik has accepted his resignation and sent it to the governor. Bhubaneswar: Manoj Ranjan Nayak, chairman of Sikshya O Anusandhan Charitable Trust that runs Sum Hospital where 21 people died in a fire on Monday, was on Thursday arrested after he surrendered before police in Bhubaneswar. The state government had lodged two FIRs against the hospital management, citing negligence in terms of fire safety and evacuation of patients during the mishap. With the arrest of Nayak, the number of those held in connection with the fire tragedy now stands at five. Chennai: The state government has made fire lifts and ramps mandatory for new hospital buildings in major cities across Tamil Nadu for quick evacuation of patients during fire accidents. The fire safety measures, notified by the department of housing and urban development, have also specified a setback space on the hospital premises for free movement of fire and rescue vehicles. Kolkata: A dengue patient admitted to All Asia Medical Institute in Gariahat attacked three nurses with a metal stand used to suspend IV drops when they tried to administer an injection early on Thursday and fled the spot. Subir Saha, the 27year-old patient, remained untraced till last reports came in. The condition of one of the nurses was said to be critical.